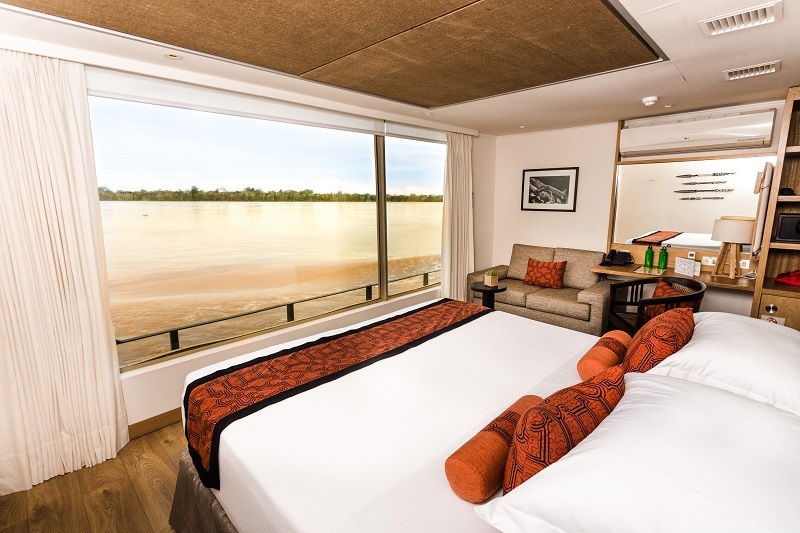 Get a taste of the remote wild beauty of the Amazon with this four, five or seven-day luxury cruise along the Ucayali River. 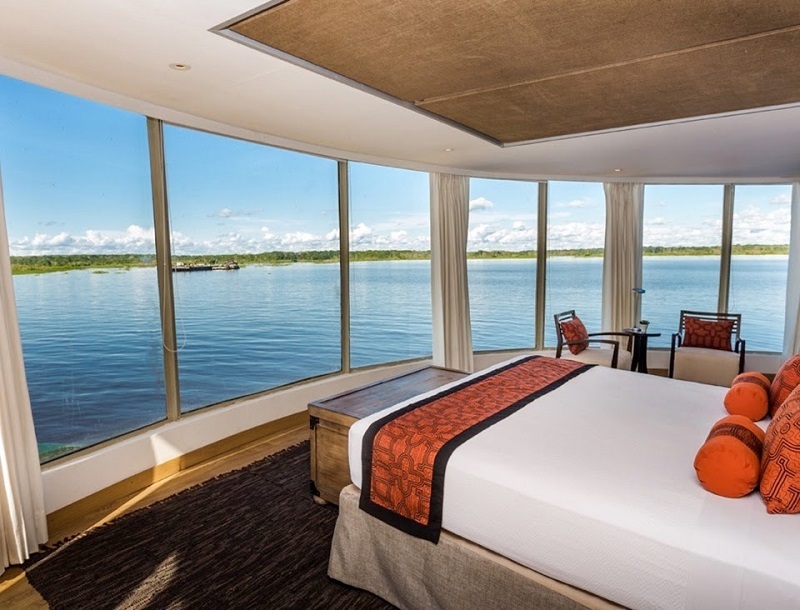 Enjoy air conditioning, an orthopedic bed and gourmet meals as you delve deep into the southeast end of the Pacaya Samiria Reserve, one of the most pristine and well-protected flooded forests in Peru. Hop into skiffs and get up close and personal with the wildlife that lives in the lagoons and tributaries of the Marañon and Samiria Rivers. Spot macaws, several species of monkeys, caiman alligators and pink river dolphins along the way. 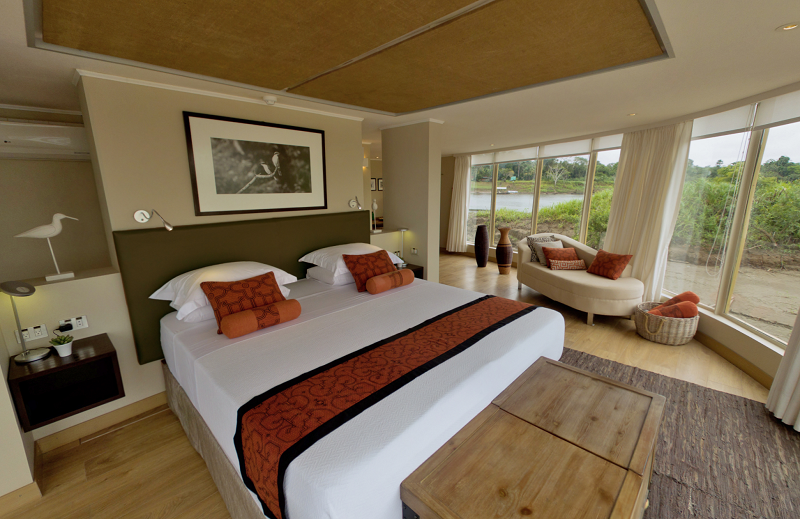 This trip gives you the chance to visit remote and unforgettable jungle in comfort and style. Your guides will meet you when you land at the Iquitos airport to take you via private transport to Nauta, where you will meet the Delfín III. The trip to Nauta, a small 19th century port city, takes about 1.5 hours; lunch will be provided along the way. 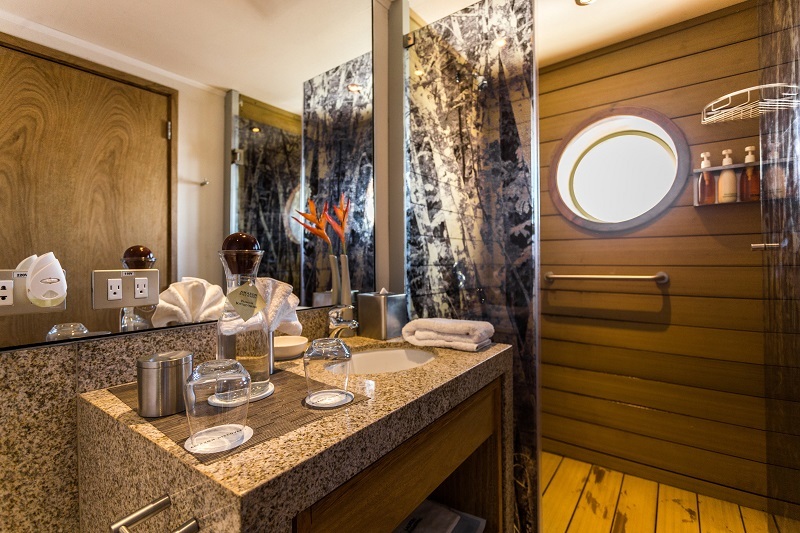 When you arrive at Nauta you will be greeted by the Delfín III’s crew, who will help you get settled in to your suite, which is fully equipped with a private bathroom, orthopedic bed, air conditioning and a private terrace. After breakfast, you’ll climb into an aluminum skiff to explore the Samiria River and its tributaries for a glimpse of the local wildlife, including toucans, umbrella birds, blue and yellow macaws, scarlet macaws, river otters, capybaras, monkeys and more. The area is also a preferred feeding ground for river dolphins, so keep an eye out. After breakfast, you’ll get a chance to spend time on terra firma, a trail in a non-flooded part of the forest. The Fundo Casual trail is full of wildlife you can’t see from the water; your guide will point out a number of the jungle inhabitants that may be hard to see because they’re so well camouflaged. Next you’ll take a short skiff ride and a short walk to the village of San Francisco. Meet the local villagers whose families have called the area home for generations. Check out the arts and crafts the women create at their artisan market. Afterward your guide will take you on a walk through the jungle in search of the area’s nighttime inhabitants. Your guides will meet you at the Iquitos Airport and take you via private transport to Nauta, 1.5 hours away by paved road. Nauta is a port town on the Marañon River, and was the first settlement in the Loreto region. Lunch is provided along the way. 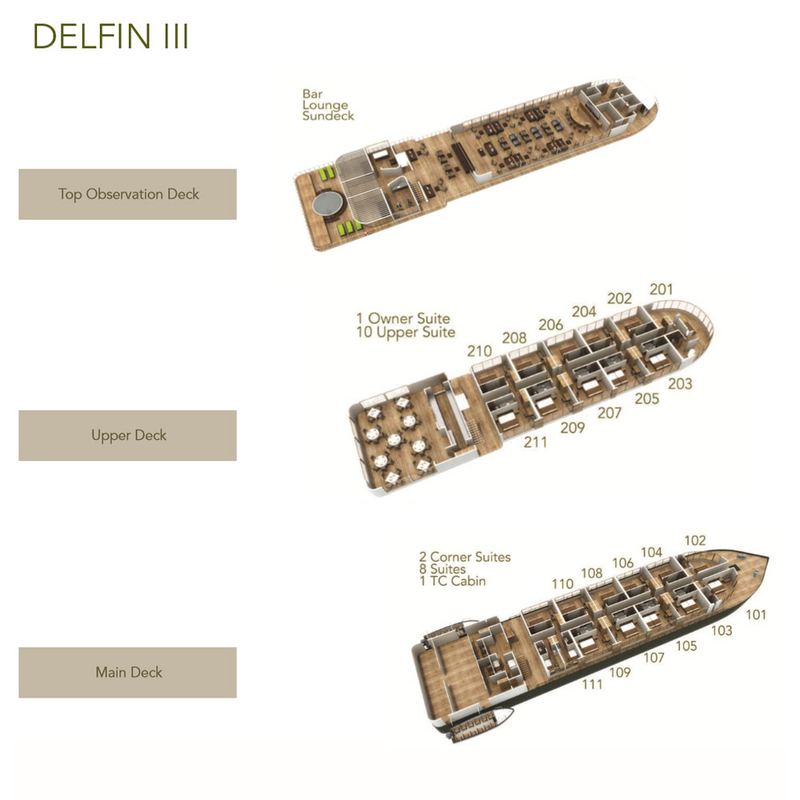 At Nauta you will board the Delfín III. The staff will help you settle in to your suite, complete with private bathroom, orthopedic bed, private terrace and air conditioning. After breakfast you’ll head out on skiffs to explore the rich abundance of the Samiria River and its tributaries, including capybaras, monkeys, toucans, umbrella birds and more. You’re also likely to see river dolphins, as this is a favorite feeding ground. This morning the Delfín III will cruise through the Yanayacu and Pucate Rivers, slowly exploring neighboring creeks and lagoons. You’ll even have the chance to swim with the pink river dolphins if you wish! In the morning you’ll get a chance to spend some time on terra firma as you take a hike in a part of the jungle that is not flooded forest. Your guide will help you keep an eye out for some of the animals and plant life that live on dry land. Afterward you’ll take a short skiff ride and a walk through the jungle to reach San Francisco, a small community with a market featuring the crafts of the local women. Afterward you’ll explore the jungle on a nocturnal safari with your guide, seeking out some of the area’s nighttime inhabitants. Life Jackets: 80 life jackets on board.